What do you get when you rock a holistic, integrative, Soul-based curriculum and approach to Art Therapy and Counseling, in a powerfully transformational dual degree program? You get grad school surprise, and exponentially experiential and life-changing experiences. One of the single most transformative classes that I attended in 2015 was the Sand Tray/Sandplay with Children and Adolescents, an elective option for the Children’s Mental Health Certificate Program. This particular class has a Jungian slant to it. I hadn’t planned to attend the course at all, yet an unexpected health issue meant that I couldn’t attend the 2015 Vision Quest in Death Valley (a course in the Transformational Ecopsychology Certificate Program which focuses upon earth-based healing traditions and how to integrate such cross-cultural approaches into work with clients). Because my drop-add occurred on the Friday AM of the weekend, it was all I could do to get to the course on time that night. I approached the work intuitively. Over the three days, I tended to very carefully add and subtract living archetypal talismans, small toys or objects provided by Southwestern College. One of the first things that struck me about the initial tray was the Darth Vader character. 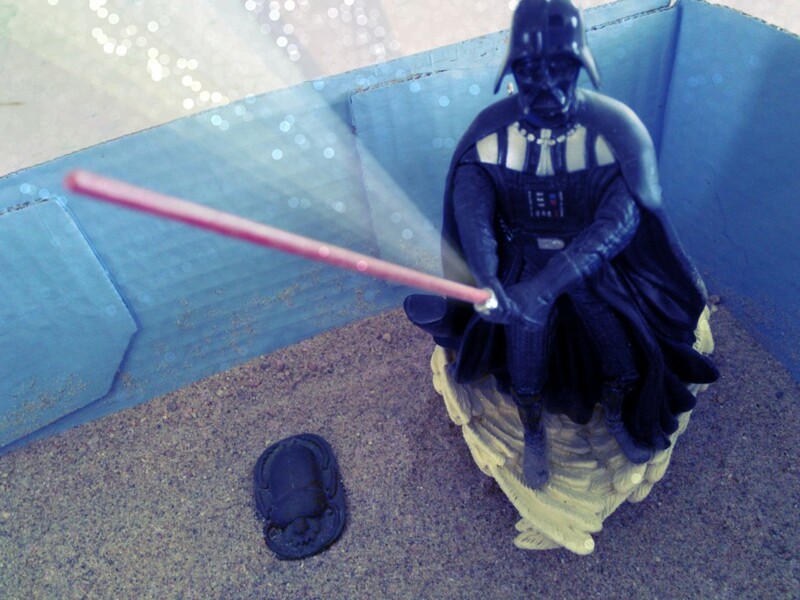 “Darth Vader in Star Wars epitomizes the shadow version of the father archetype, (Darth Vader literally means “Dark Father”),” (William Indick, 2004) and it quickly became clear that the work I was doing was about the unhealed shadow of my internal father. It was the masculine in my psyche that was present for healing… my animus. My sand tray work facilitated sublimation of intense negative affect as well as pointed the way for future work. The following week, in an art therapy studio techniques class, I did a nature mandala of sorts, related to accessing, processing, and releasing anger, or hatred of the father (self, in the Jungian sense of my own internal father archetype), which was a continuation of my sand tray weekend. Although I wrote a 9 page paper about my sand tray and sandplay experience, I could literally write a book… the work was just that powerful and deserves careful contemplation. Classmates have shared that the other Certificate Program courses (which generally qualify as electives in the degree programs) are equally powerful. 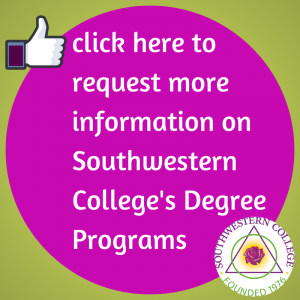 This type of training contributes to the success of Southwestern College graduates. The Certificate Programs are open to people with an undergraduate or graduate degree (and though many current SWC M.A. degree students take coursework to create specialty area(s) in their studies, other people working in the helping professions also attend these trainings). Often Certificate Program coursework is offered in weekend seminars/trainings and attendees may earn 20 CECs or 2 graduate credits. If you’re interested in an exponential experiential Art Therapy and/or Counseling grad school program or the SWC Certificate Programs (and your own powerful transformation), request an information packet today!